Installing LED garage lighting will vastly improve your work rate as you will be able to see more clearly. Most garages lack natural light, which makes lighting an essential component of your garage during the day or night. The best garage lighting is the Hyperikon LED Pull Chain Lights, which offers 45,000 hours of operation at 4,800 lumens and comes with a 5 year limited warranty. LED garage lights perform far better when compared with the fluorescent alternative. This is due to a longer life span, brighter light and reduced bills. Most garages will require multiple lights, therefore its important that you find the best. Many people that are searching for garage lighting ideas will be choosing between a fluorescent or LED bulb light. LED garage lights are up to three times brighter, last three times longer and consume less than 60% energy without flickering. Therefore, the LED bulb is best option with a range of different style of lights available. 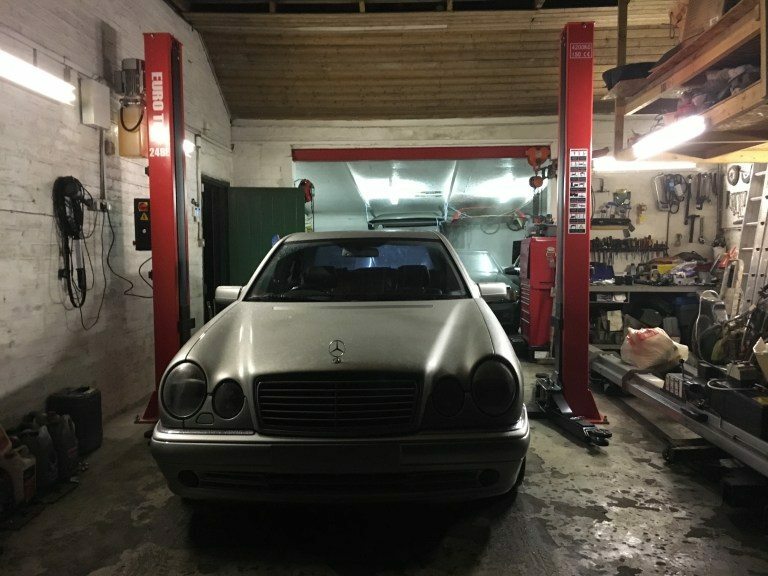 Garages are very popular in the majority of homes and this bring the requirement for garage lighting to be upgraded from time to time. The upgrade can improve your work rate, save you money and improve the appearance of your garage or workshop. 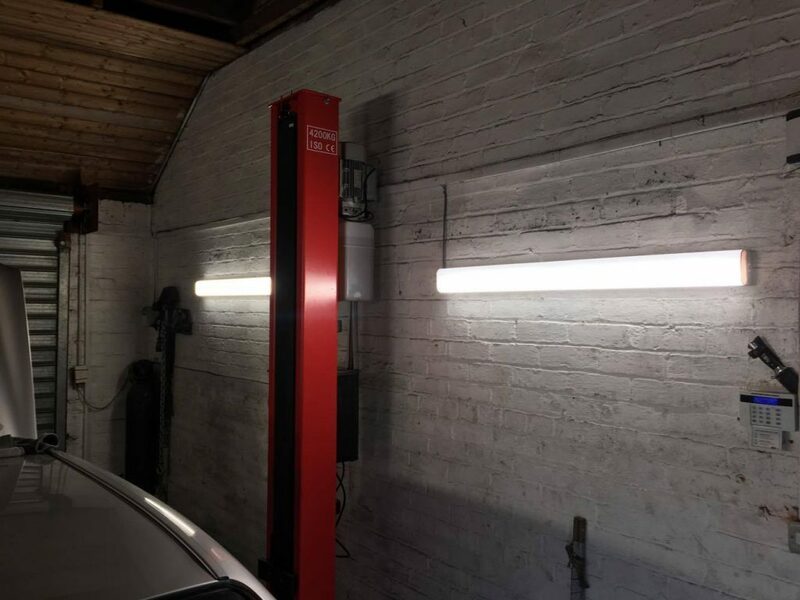 Below is a list of the best garage lighting that provide bright light and are available in a range of different styles to suit the decor of your garage. Hyperikon are leading the way as the most popular garage lighting in the US and for good reason too. They are a plug in and play units that require no complex installation and you are able to have them up and running in less than 10 minutes. Hyperikon promises that these lights don’t flicker, buzz and contain Mercury or UV. They consume only 38 watts of electricity and upgrading to these LED garage lights will not only save you money but they also look great. Overall, the Hyperikon garage lighting ticks every single box and are the best garage lights you can buy. They are slightly more than some of the alternatives but these are the easiest to setup. Even the most basic DIY’er can install these garage lights without requiring an electrician. Sunco are a big brand in the lighting industry and these LED garage lights are high performers that are popular throughout the US. They are best used within a garage or workshop setting but many people do use them for other applications. If you are looking for “bang for your buck” then these Sunco garage lights are available in various bulk buy options. As they are linkable via a “daisy-chain” configuration, they are great for buying in bulk and transforming your whole garage. When you consider the performance, durability and price, they are by far the best value garage lighting you can buy for the money. The Luceco garage lights are the cheaper alternatives to the above with very similar performance. They can also be bought in various bulk options but have the major drawback of not being able to be linked together. Another potential issue that some people may face is the lack of protection as there is no housing. However, if they are not going to be subject to any moving objects, this shouldn’t be an issue. On a positive note, this may be an advantage as they will be lighter and easier to install. Overall, they are cheap LED garage lights that come with a 5 year warranty for peace of mind. The fact they cannot be linked means that they require a separate power source for each light, which limits the amount of units you can have installed. Hyperikon produce other garage lighting with this high bay light fixture being an alternative style. It is 2 feet long, which has the benefit of producing a lot of bright light. The brand state that per watt, these garage lights produce 130 lumens and there are a variety of power option to choose. The motion sensor technology is a desirable feature and it works from up to 80 feet away. The lights will dim to 10% after 30 seconds of inactivity and then shut off completely. If you do not want this feature, it can be disabled with a single button. The Hyperikon LED High Bay Light Fixture is one of the brightest garage lights available and due to the size, it is more suited for larger garages. Prime Lights are a lighting manufacturer that proudly make their lights in the USA. These T8 LED HighBay lights are UL Listed and DLC Approved and offer excellent value for money. For those that require durable garage lighting, these are a great option with a 20 gauge steel body housing that has been thermally painted. Overall, the Prime Lights T8 LED HighBay are excellent garage lights that produce a large amount of lumens per watt. This means they are highly energy efficient and compared to similar style LED garage lights, they are relatively affordable. Another reasonably priced garage light is the French May unit, which uses a pull chain mounting and are linkable via daisy chain hardware, which are included. French May claim that these commercial grade garage lights will last up to 22.8 years based upon 3 hour usage per day. The dimensions of the French May garage lights are 48 inches in length, 5 inches in width and 2.5 inches in height. It can be mounted with pull chains and all the daisy chain hardware is included with the light itself. As with all the other garage lighting, the French May offers a five year warranty for peace of mind. It is ideal for the majority of garages and is easily linkable with built-in power cords that are 44 inches long. If you are wanting to upgrade your garage lighting, you are more than likely going to purchase many units. Therefore, it is crucial that you take your time to research the different types available and ensure that you do not buy the wrong one. There is a whole range of LED garage lights available and they are all fairly easy to install. All of our recommendations above are highly popular in the US and can be use for both commercial and home garages. Below is our in-depth buying guide to help build your knowledge with regards to garage lighting. It is not always the case that the brighter light is the best option. You may need a certain brightness for different situations. For example, if you want the light near the work area, you will not want anything over 8,000 lumens as the reflection may blind you and reduce your working efficiency. Brightness is measured in lumens and the higher the lumens, the brighter the light. 4,000 lumens of brightness is more than ideal for the majority of garages but some may have different setups such as the size or number of windows. Therefore finding the best garage lighting is dependent upon your specific garage setup. If you want to go further and do some calculations to get the right amount of lighting for your garage, there are two measurements called Lux and Footcandle. To measure illumination, you will use the Lux measurement where 1 lux is equivalent to 1 lumen per square meter. Footcandle is very similar but uses square feet as opposed to square meter. Further information can be found at via this article. The majority of garage lights will be just under 50 inches in length, with some units having up to 4 bulbs within the housing. However, you will have to analyze your garage setup to determine which lighting you require. Depending upon where the windows or other natural light sources are located, most people will have up to 3 or 4 lights near the car. Other areas to locate garage lighting would be near the tool chest, work bench and other locations. Some premium garage lights may include housing covering the bulb that will act as protection and reflect light back down to the intended area. The housing is not an essential but if objects within your work space can find themselves hitting the light at any point, it may be best that you purchase garage lighting with housing. Paying a little extra for garage lighting that will last 10,000 hours or more should be seen as an investment. High quality garage lights such as the ones listed above can last at least 40,000 hours. You should avoid garage lighting that doesn’t last this long as you will be rewiring a new one much early than you expected. LED’s are known to use 60% less energy compared with other forms of fluorescent lighting. This will save you a significant amount of money each year. Although this is probably not the first thing on your mind, it is certainly a worthy excuse to upgrade to LED garage lights. Kelvin is the dimension used to describe the color of the light from the bulb used in your garage lights. For those that have used a HID conversion kit before, you may be more familiar with the ratings such as 4,000K or 8,000K and others. The most common range is between 1,000K and 10,000K, which provides a yellow to blue glow. Garage lighting is usually between 4,000K and 7,000K as its the most natural color lighting. Below is the Kelvin Temperature Chart for a visible representation of what to expect from your LED garage lights. Garage lighting can weigh slightly more than the average light as they use heavy duty steel for the housing. If you are planning on installing these lights yourself, you will want to ensure it is not too heavy. All the garage lights mentioned above are fairly lightweight and can be installed with a variety of hardware and mounting brackets. Many of the lights are linkable and can run from the same power source. There is nothing worse than having multiple different brands of lighting providing different levels of lighting. Many include pull chains, which is very useful for those not wanting to wire the power to a light switch. The switch types is a feature that is dependent on the garage owners preference with many preferring pull-down chains, while others prefer the plug that goes straight to the switch. Both are practically the same in terms of pricing and performance. Mercury vapor gas found in fluorescent lighting is temperature sensitive, which can cause issues with the lighting. However, LED do not use any form of gas to produce light and is completely unaffected by the temperature. If you are working in cold conditions and still using fluorescent lighting, we strongly recommend you buy a garage heater to warm those lights up. This is not something to worry about if you are using LED garage lights and it is a big advantage for those working in cold environments. Fluorescent lights have been around for many years and they will remain until the garage owner decides its time to upgrade. LED garage lighting used to be much more expensive than it is today, making it an out of reach option for many people. However, these days they are far more affordable and can completely transform any garage using fluorescent alternatives. Approximately 30% more efficient in terms of lighting and brightness. Directional at only point the light in one direction as opposed to 360 degrees like fluorescent lights. LED lights use energy to produce light and not heat, which wastes a lot of energy. Lifespan of fluorescent lights is only around 14,500 hours whereas LED’s will last up to 50,000 hours. There is no Mercury and no UV emitted from LED bulbs unlike fluorescent lights. As the years go past, more and more garage will begin to use LED garage lights. Fluorescent lights will be a thing of the past unless it is a specific requirement. 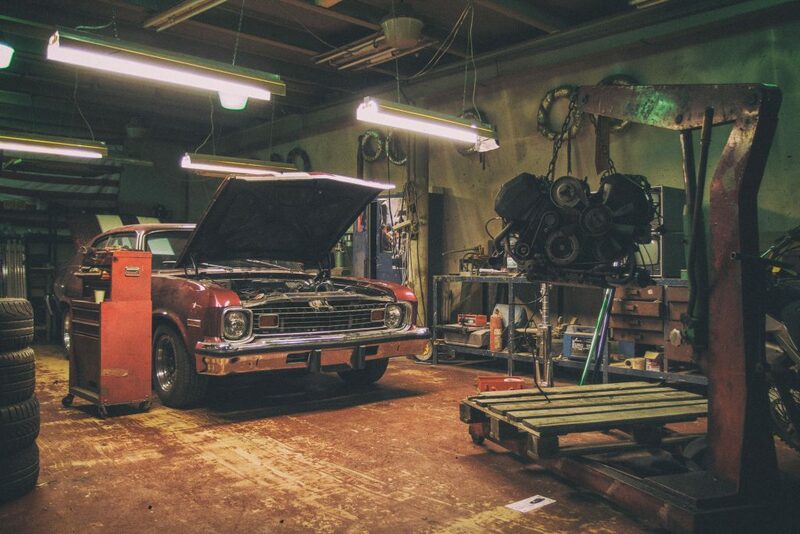 Upgrading your garage lights will brighten up your work space and make working on your car that much easier. There are many garage lighting ideas but sticking to the recommendations within this article will ensure you have the best possible. In my very own garage, I have installed 8 Hyperikon garage lights, which made a huge improvements. They are placed strategically with 4 being placed on the sides of the car lift and the others at the back where more cars are stored. If you are still using the older fluorescent technology, you could even save money by upgrading to the latest LED garage lights, which is another reason to upgrade.